Calm down folks, a total no-no for us. Buses etc can't get up the long, steep climb to the Amber Fort. 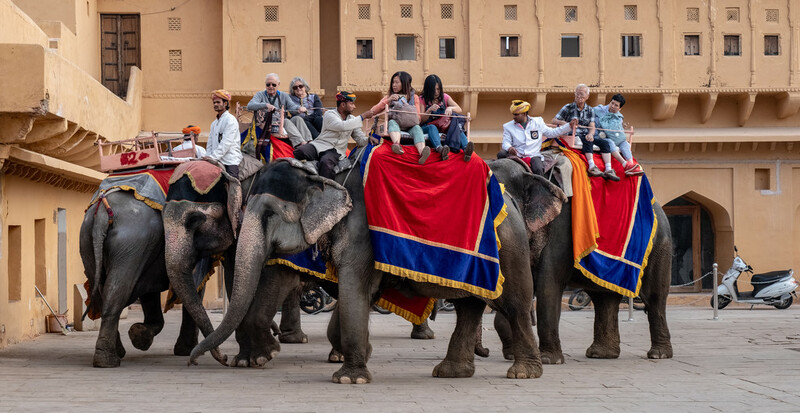 Elephants used to be the common way to get to the top, now it's mostly jeeps because, according to our guide the vast majority of Aussies/Kiwis and Western Europeans won't ride on these poor exploited animals. Pity the rest of the world doesn't think the same way. No mention of North Americans, but one would assume they're included amongst the Forces of Light. We had none in our group. @jgpittenger Made my blood boil. It's probably the only life the elephants have ever known. This shot reminds me of the camel rides in Israel- but there you can see the camels are taken care of. Hopefully these animals are treated well when they're not working. And yes, I think most "northerners" would be bothered by it, but it is a good shot. I feel that respect for the animal should be of paramount importance. This is so sad to see especially in contrast to the amazing elephants I had the privilege of seeing in Tanzania. What a contrast of life for these poor creatures. The photo is journalistic quality in what it conveys. This might be a way to make money to feed the elephant. @gilbertwood The sight upset me. @olivetreeann I'm none too sure that these animals were kindly cared for, very likely not. @joysabin We are of a mind. @taffy And the beautiful elephants we saw in Sri Lanka too, Taffy. This sight really upset me, I thought these days were long gone. Yes, I recoiled when I saw these elephants. But there are various things to do with wildlife that make me recoil right here in OZ. @ethelperry Absolutely agree, on both counts. It's quite abhorrent to see elephants exploited like this and the unthinking idiots sitting on them need brain transplants. Such beautiful creatures - such a shame. Makes me wince to think about it. @fbailey I had quite violent (passing) thoughts about tearing the stupid people off the poor animals.